Davies Symphony Hall is located at 201 Van Ness Avenue in the Civic Center area of San Francisco. The Box Office is conveniently located on Grove Street between Van Ness Avenue and Franklin Street. There is an additional public entrance above the Box Office which can be accessed by walking up the stone steps on either side of the Box Office. The entrance at Van Ness Avenue and Hayes street is no longer a public entrance. Davies Symphony Hall is easily accessible from Muni Metro (Van Ness or Civic Center stations) and BART (Civic Center station). Construction of the Van Ness Improvement Project, which affects bus stops and sidewalk access near Davies Symphony Hall, is expected to continue through 2018. Visit 511.org, sfmta.com or bart.gov for route or schedule information. Please contact Patron Services at 415-864-6000 or messages@sfsymphony.org with any questions. Multiple parking options are available within walking distance to Davies Symphony Hall. Due to the Van Ness Avenue transit improvement project, please allow extra time to park in and around the Civic Center area. Please know that construction to improve the Performing Arts Garage is expected to be ongoing from April through August 2019. To avoid long lines and congestion, consider parking in the newly renovated Civic Center Garage with improved lighting, security, and pay-on-foot machines. The San Francisco Symphony will continue to offer complimentary shuttle service for select Davies Symphony Hall classical concerts with a new vendor, Bauer Transportation. Chariot will no longer be our service provider. 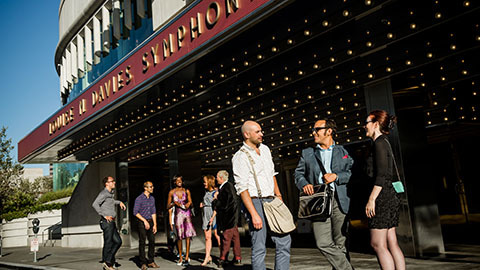 To Davies Symphony Hall Box Office: Continuous loop from the corner of Grove Street & Hyde Street to the Box Office beginning at 6PM for select evening concerts and 12PM for select matinee concerts. From Davies Symphony Hall Box Office: Continuous loop from the Box Office to the corner of Grove Street & Hyde Street for one hour following the performance. The shuttle will run from 12pm - 6pm for select matinees and from 6pm-12am for select evening performances. Click here to see select concert dates when shuttle service is available. In order to ensure the best possible patron experience, a member of the Symphony staff may ask to see your ticket as we measure patron ridership and explore new ways to improve this service. Please be aware that the pre-concert BART pickup location will remain on the sidewalk at approximately 9 Grove Street although the escalator exiting the BART station at Grove and Hyde is closed. No reservation required. This service is free of charge. Racks are available on Grove Street, near the corner of Franklin. Please provide your own lock. Parking lots and availability, as well as SFMTA and BART transit information, are subject to change. The San Francisco Symphony assumes no responsibility for changes which may occur, or for lost articles, theft or damages.